Organization is a skill that takes time and effort for it to become a life-long habit. Once it becomes second-nature for you, it will positively affect many other areas of your life. There are several approaches you can take to elevate your organizational skills and several will be shared below. If you’re looking to enhance your organization skills and get a firm grasp on your New Year, consider these 10 organization tips that will help you get your life together and develop positive habits. Goal setting is the first step to getting organized. By creating your own set of priorities, you’re eliminating what doesn’t serve you and focusing in on positive, productive energy. The trick here is to start with small, attainable goals as opposed to one major one. This will help you eliminate feeling overwhelmed and allow you to celebrate small victories. It’s easy to miss the gym or slack off on your passion project when there aren’t any real consequences to your actions. Instead of leaving your progress up to chance, hold yourself accountable to actually doing what you set out to do by giving yourself rewards for completing a task or restricting yourself from a desirable activity until you’ve completed your task. This will help you to stick to your schedule and stay organized. In order to meet your goals and stay motivated, you have to reward yourself. Celebrate even the smallest of victories and reward yourself with self-care “treats” when you meet your goals. This will keep you excited about your goals and motivated to continue. Planner and organization apps or simple calendar reminders on your phone are effective at this task. Planners are very trendy right now and with good reason. People use them as scrapbooks, journals, organizers and more. Keep your life organized by investing in a good planner. This will give you a visual of what you need to accomplish. You can write out your feelings, create monthly vision boards and keep track of your events. Tips on how to do this using a bullet journal are below. Writing out your responsibilities will give you clarity that’s unmatched. Trying to stay organized in a cluttered space is counterproductive. In fact, it can bring about more stress than you initially intended. Clear your mind and relieve some of your organizational stress by cleaning out all forms of clutter you may have. Throw away and donate old clothes, paper, memorabilia and junk that’s simply holding you back. This will help you develop your mental strength and stay organized. Each month provides an opportunity for a new start. Take advantage of this gift by setting goals you can meet. If you noticed that you struggled with productivity last month, make that a priority this month. It even helps to create vision boards with your monthly goals illustrated on them. This will help you to stay on track in the coming months. If you have any big goals for the year, break them down into actionable tasks to carry-out each month that will see you getting closer to your goal. One of the biggest hurdles to sticking to your personal schedule is getting caught up in other tasks. Let’s say for example, Wednesdays are your designated gym days. However, your friends want to go out for drinks after work on Wednesday night. You haven’t been sticking to your schedule and it’s impacting your mental health. What do you do? Well, start by learning how to put yourself first and say no. Distractions, whether positive or negative, can throw you off of your schedule. This can make you feel disorganized and anxious. Learn how to say no and not feel guilty about it. We’ve all been there – rushing to get everything together while still trying to make appointments on time. The best way to alleviate those rushed feelings is to prepare for your days the night before. Lay your clothes out, pack your lunch and get your items ready before bed. This will make your morning routine seamless and enjoyable. Using to-do lists is an excellent way to know what to expect each day so that you can better schedule your time. If you don’t write down what you need to do each day, it is not only easy to forget things, but you may spend too much time on one task, then fail to get everything done by the end of the day. Start off each day by sitting down with your bullet journal (or better yet, from the night before as above) and writing absolutely everything to be done that day, from appointments and going to work, to what you are cooking or chores that need to be done. Nothing is too menial of a task to put on your to-do list. Instead of just sticking with the standard monthly calendars, also use a weekly calendar layout. The reason why this is useful is because it offers a larger space for writing notes and lists. This is not usually for a detailed daily to-do list, but has some general notes of things you need to jot down or remind yourself about throughout the week. Where the monthly calendar might just list your symbols for things happening that day, the weekly calendar entries can include some words and phrases as well. Of course in order to schedule your time with your bullet journal, you should be adding all appointments and tasks. Try to make it a habit to open up your journal when a new appointment is made. 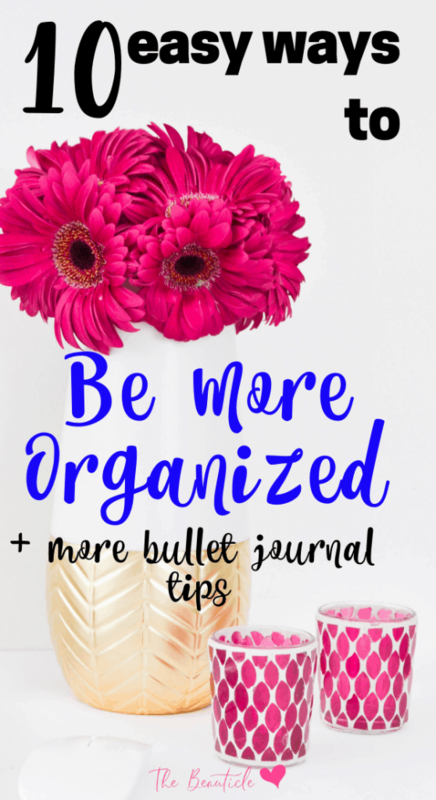 If you have a hard time keeping up with your household duties, then a bullet journal can help you become more organized in this area. Make a list of all household chores to be done on a monthly basis, then break them up into what needs to be done weekly and daily. If you have other members of your household that will be helping with them, you can assign certain chores for that as well. Getting organized is definitely a challenge, but a fulfilling one. Make your life great by implementing these helpful tips into your daily routine. You’ll begin to feel more organized and prepared for everything that comes your way.